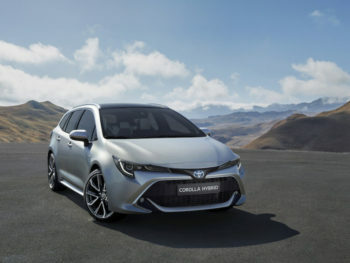 Toyota has previewed the forthcoming Corolla Touring Sports, ahead of its debut at the Paris Motor Show this autumn. Featuring a 10cm longer wheelbase and claimed best-in-class rear seat passenger legroom, the Corolla estate is intended to provide “a key model for people looking for practicality and style without compromise”. Boot space with the seats up stands at 598 litres VDA compared to 507 before but maximum boot space hasn’t been announced yet.Revealed just days after Toyota announced that the replacement to the Auris range will revive the Corolla name, bringing the UK and Europe back in line with other global markets, the new model replaces the Auris Touring Sports and brings bigger boot space, sleeker, shooting brake-orientated styling to distinguish it from the hatch and an engine line-up that marks the debut of Toyota’s dual hybrid strategy. Engine line-up echoes the hatch and drops the 1.6-litre D-4D in the former Auris Touring Sports line-up as per Toyota’s plans to phase out diesel cars by 2019. Instead, it offers just one conventional engine – a 114bhp 1.2-litre turbo petrol unit – and a choice of two hybrids. These cover an improved version of the 121bhp 1.8-litre seen in models such as the C-HR and a new 178bhp, 2.0-litre. Fuel and CO2 figures are yet to be revealed. The new estate features a MacPherson strut front suspension system, a new multilink rear suspension arrangement, new shock absorber valve technology and, for the first time, the availability of Adaptive Variable Suspension (AVS). Equipment on offer includes head-up display, JBL premium sound system, wireless mobile phone charging and the Toyota Touch Multimedia System.